Just like Charlie Sheen we’re still winning.. Wine competitions that is! The smooth and delicious 2010 Petit Manseng took a bronze at The 2011 Monticello Cup while our crisp 2010 Chardonnay won a silver in The 2011 Governor’s Cup White Competition. We always knew our 2010 Cabernet Franc would look better with a little bit of bling around its neck! Its pure deliciousness won a silver medal at the 2011 State Fair of Virginia. 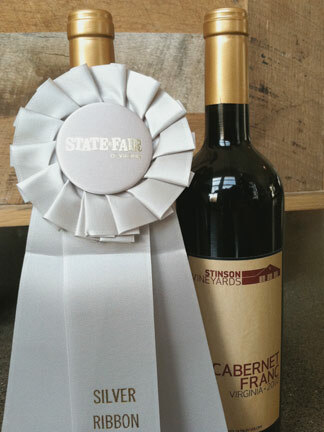 Stinson Vineyards also took 3rd place in Overall Winery Presentation for label design – congrats to our talented designer Jonathan Greenblat. Wait til you see what he’s dreaming up for our 2010 Meritage label!